Et Verbum: The Condition of the Suffering souls in Purgatory, by Rev. John A. Nageleisen. On the Means of Relieving the Suffering Souls. Part 8. The Condition of the Suffering souls in Purgatory, by Rev. John A. Nageleisen. On the Means of Relieving the Suffering Souls. Part 8. § 24. Confraternities for the Relief of the Suffering Souls. 99. In the middle of the eighteenth century, the Danube, being blocked with ice, flooded a great part of Vienna, thereby causing great damage to valuable property and threatening the lives of many of the inhabitants. The force of the angry waters had already carried off barns, undermined houses, and threatened the lives of all the inhabitants of the suburbs Leopoldstadt and Rossau. The lamentations, and cries for help beggared description. Multitudes witnessed the heart-rending scene, but no one dared to come to the aid of the unfortunates, the danger was so great. The news of the distress was brought to the imperial palace and to the ears of the emperor Francis. Scarcely had he been advised of it, when he hastened to the scene of disaster, and jumping into a boat, called out, "Who has the courage to save lives with me?" The emperor's word and example inspired all present, and soon boats and skiffs were manned with rescuers. All in danger were saved, not a life was lost. This was assuredly a royal deed of the Austrian emperor, and a heroic deed of those who joined him, worthy of being recorded on the pages of history and of being held up as an example to coming generations. But what spiritual lesson does this deed convey to us? First, that we ought not to shun danger, however great, when there is question of saving life; secondly, that we should not stand by unaffectedly when there is question of saving from the lake of fire the souls of our brethren. Therefore, let us demonstrate our fraternal charity by joining a confraternity for the relief of the Suffering Souls. 100. Terrified at the thought that, as Bellarmine expresses it, "but few just men will escape the exceedingly great pains of Purgatory, because only a very small number are admitted to heaven through the supreme mercy of God immediately after their death," compassionate souls resolved to come to the aid of their deceased brethren by the extraordinary power of united prayer and other works of suffrage. The joint intercession, the increased devotion, the multiplied grace, the virtues and merits of brethren united in God, in a word, the charitable union for the relief of the Suffering Souls is a powerful means of moving the Heart of a God so full of compassion for His children in distress. As it is a holy and wholesome ministration of Christian charity to pray for souls departed in the faith of Christ and in His divine grace—souls that are, nevertheless, still subject to temporal punishment and unable to acquire merit for themselves—, therefore numbers of Catholics have formed unions for the purpose of coming to the aid of their deceased brethren. 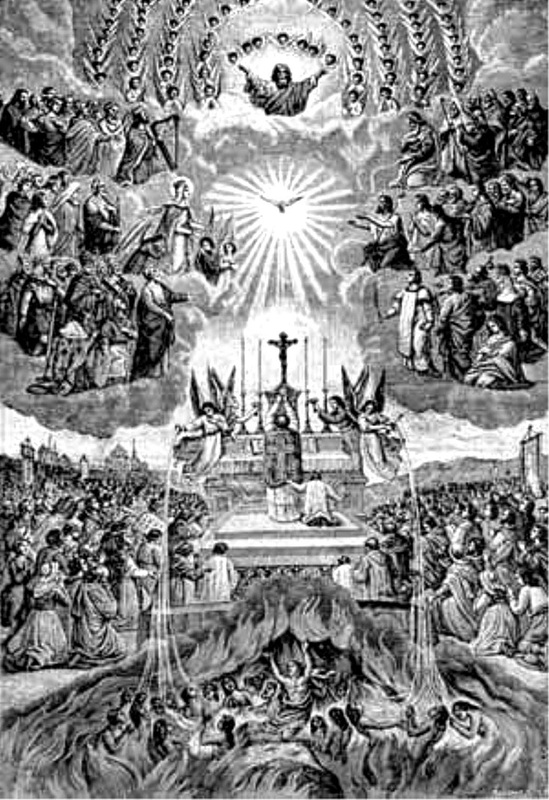 By continual suffrage and sacrifice these zealous Christians, thus united, endeavored to release from the fiery prison of Purgatory as many souls as they could in the shortest time possible. Hence they resolved, without binding themselves under pain of sin, to offer up for this end the Seven Offerings of the Most Precious Blood, or seven times the Glory be to the Father, etc., or to say the rosary, or some other prayer of their choice, with the addition, "Eternal rest grant to them, O Lord! May eternal light shine upon them, and may they rest in peace. Amen. "—If they are able they give every month a small pecuniary contribution as stipends for Holy Masses to be said for the Suffering Souls, or to be applied for the expenses incurred in the propagation of the Confraternity for the relief of the Suffering Souls. The members also give each other mutual encouragement in the performance of other good works for the relief of the Suffering Souls, for instance by assisting poor boys who have a vocation for the priesthood, by contributing to the conversion of the heathens, to the support of the poor and sick; they often visit the Blessed Sacrament, propagate devotion to the Blessed Virgin Mary, assist poor churches, etc. They incite one another especially to assist often at Mass, and to receive holy communion frequently. This latter is prescribed by the rules of the Confraternity, and one member is encouraged to it by the good example of the other. They are further encouraged by occasional meetings and special sermons, and by indulgences granted both for membership in the confraternity, as also for the performance of good works and the reception of the sacraments as members thereof. 101. This Pious Union for the aid and relief of the Suffering Souls is founded on the faith in Christ, without which faith there can be no true spiritual fraternity of mankind. True, all men became brethren through their creation by the same God, but they did not remain what they were, namely obedient children of God. As a result great misery visited mankind—hatred interiorly and war exteriorly. Then Christ came into the world. "He came into His own, and His own received Him not. But as many as received Him, He gave them power to be made sons of God." (John i. ii, 12.) Once children of God, they are also brethren. Hence Christian fraternity is founded on faith in Christ. With St. Peter the early Christians exclaimed: "Thou art Christ, the Son of the living God," and thus became united with one another. "And all they that believed were together, and had all things in common. Their possessions and goods they sold, and divided them to all, according as everyone had need." (Acts 11: 44, 45.) They persevered together in prayer. This same faith must animate us, the faith namely which shows us God as the common Father of all men, and all men as our brethren in Jesus Christ. This faith directs our attention also to our departed brethren in Purgatory. It speaks to our hearts, thus: "Behold these souls in Purgatory, so severely tried and entirely helpless : they are your brethren !" This faith, living and operating in the souls of those who profess it, will naturally hold them together in the bond of a truly Christian fraternity. 102. The charity of Christ unites the various members of the Church. God Himself inscribed indelibly into the hearts of men the command, "Thou shalt love God above all things, and thy neighbor as thyself." But as soon as man turned his eyes towards the forbidden tree in paradise, satan obscured this divine command and replaced it by self-love. Inordinate self-love caused all the misery that followed the fall of man ; selfishness was the source of all his tears, of all the streams of blood unjustly shed. Fraternal charity had vanished from the world. Then Jesus came to re-unite and strengthen the disrupted bond of charity, as He Himself declares in His farewell prayer, "Holy Father, keep them in my name, whom Thou hast given me, that they may be one, as we also are." (John xviii. ii.) This union He achieved by His divine love for us which He manifested by His "death on the cross. "Greater love than this no' man hath, that a man lay down his life for his friends." (John xv. 13 ) Who can view this love sacrificing itself 011 the cross and close his heart to charity ? Forsooth, only a heart of stone could do so! Where charity is enkindled in a heart, and especially where charity for our suffering brethren in Purgatory dwells, there is the true spirit of fraternity; and the more sublime and ennobled this charity is, the stronger is its bond, the more meritorious its ministry in behalf of the souls in Purgatory. 103. The Confraternity, moreover, must be enlivened with the spirit of Christ. Without spirit there is no life. When man opened his eye, ear and heart to satan, the image of God in his soul was disfigured and concupiscence was enkindled. St. Paul portrays the miserable condition of man, saying, "All have turned out of the way, they are become unprofitable together, there is none that doeth good, there is not so much as one. Their throat is an open sepulchre, with their tongues they, have dealt deceitfully; the venom of asps is under their lips: whose mouth is full of cursing and bitterness; their feet are swift to shed blood. Destruction and misery are in their ways, and the way of peace they have not known : there is no fear of God before their eyes." (Rom. iii. 12—18.) Horrible thought, that man could thus debase himself! Christ by His death triumphed over sin, and diffused His Spirit into all that converted themselves to Him, according to His promise by the prophet, "I will pour out my spirit upon all flesh : and your sons and your daughters shall prophesy; moreover upon my servants and handmaids in those days I will pour forth my spirit." (Joel 11. 28,29.) And this Holy Spirit brought forth abundant fruits, such as "charity, joy, peace, patience, benignity, goodness, longanimity, mildness, faith, modesty, continency, chastity." (Gal. v. 22, 23.) Jesus lived and died for the welfare of mankind ; this same Spirit was transmitted also to His disciples, who excluded no one from their charity. They even sacrificed their temporal possessions for the welfare of the living and the dead. We read of the first Christians, "And the multitude of believers had but one heart and one soul: neither did anyone say that aught of the things which he possessed was his own, but all things were common unto them. Neither was there anyone needy among them." (Acts iv. 32—34.) On this principle of charity are founded the confraternities for the relief of the Suffering Souls. All their prayers and good works are directed to this end. 104. As long as this one faith, this one charity, this uniting spirit of Christ animated all Christians and filled them with the courage to lead a holy life, there is no mention made in history of special confraternities in the Church. But when error and unbelief became rampant in the world, when a worldly life gained entrance into the Church, when immorality wrought sad havoc in the Christian community, then it was that pious Christians formed themselves into a confraternity for the purpose of resisting with all their might the impending evil which endangered so many of their brethren; in a word, they combined for the purpose of combating the evil of sin, so that a pagan governor testifies of the early Christians : "The Christians often come together in their dwellings, and before they separate they solemnly promise each other to abstain from murder, theft, intemperance," etc. Confraternities for the relief of the Suffering Souls are moreover a help against transgressing that spirit of Christian moderation which the Church inculcates. They keep before our eyes the torments of Purgatory ; they direct our attention to the needs of the Suffering Souls, and dissuade us from worldly display at funerals, insisting that we should remember the souls of the departed in prayer and by good works rather than to do homage to the world and to satan by sinful extravagance at burials. 105. We are able to trace such a union or confraternity for the relief of the Suffering Souls as far back as the year 700 of the Christian era, namely in Mabillon's "Acts of the Saints of the Order of St. Benedict." In the lives of other saints also we often meet with leagues of prayer which holy persons entered into for the purpose of helping one another in mitigating the torments of Purgatory. We find instances of this in the biographies of St. Boniface, the Venerable* Bede, Abbot Eudberct of Wiremouth, and others. St. Boniface wrote to Optatus, Abbot of Monte Cassino : "We ardently implore that a bond of brotherly love unite us, so that the living offer prayer, for each other, and join in prayer and in offering the Holy Sacrifice of Mass for the deceased, whose names shall be exchanged between us for this purpose." In the St. Benedict's Stimmen of 1880 we are informed that as early as 1005 bishops, priests and clerics formed a league, the former binding themselves to celebrate a certain number of Masses after the death of a member, the latter to recite the psalter repeatedly. Emperors and kings, bishops and other persons of rank promised to give food to a certain number of poor, or to give a specified alms, and to have lamps and tapers lighted in suffrage for the dead. In our times also we find these confraternities throughout the Church, in villages and cities, for priests, religious and laymen. We now proceed to mention some of them for practical purposes, particularly such as deserve special recommendation on account of their extensive membership and their extraordinary privileges for the living and the dead. 106. The Archconfraternity of the Most Precious Blood was founded at the beginning of the nineteenth century by the Rev. Francis Albertini, who at a later period became bishop of Terracina, Italy, and died in the fame of sanctity in the year 1819. The members of this archconfraternity offer up to our Heavenly Father the Most Precious Blood of Jesus Christ for the forgiveness of their own sins, for the needs of Holy Church, for the conversion of sinners, and for the relief of the souls in Purgatory. Pope Pius VII., in 1815, raised this pious union to the rank of an archconfraternity and endowed it with numerous indulgences. These latter were added to considerably in 1850 and 1852 by Pope Pius IX., and were confirmed anew in 1878 by the Sacred Congregation of Indulgences. A great admirer and propagator of this now widespread devotion and confraternity was the founder of the Congregation of the Most Precious Blood, the venerable Servant of God, Caspar del Buffalo.—The altars of the archcon fraternity are privileged ipse facto and forever. The members have a special share in all the good works and penitential exercises of all religious Orders and Congregations in the world. (Rescript of 1852.) All the indulgences are applicable by way of suffrage to the souls in Purgatory. The Confraternity for the relief of the Suffering Souls, whose headquarters are in the Redemptorist church of St. Mary in Monterone at Rome, was raised to the rank of an Archconfraternity by Pope Gregory XVI. It is also endowed with many indulgences and privileges. It was founded in the church named in 1841, for the purpose of continually aiding the Suffering Souls by good works and sacrifices. Other well known confraternities for the benefit of the Suffering Souls are the following: The Archconfraternity of Our Lady of Intercession, at Rome; the Pious Union of Masses, at Ingolstadt, Bavaria; the Confraternity of the Perpetual Adoration, at Lambach, Upper Austria; the League of Helpers of the Holy Souls, in France, of which every Catholic can become at least an honorary member; St. Benedicts Society of Priests for the relief of the Suffering Souls, at Lambach; the Society of Priests and Association of Perpetual Masses, under the patronage of St. Joseph, for deceased priests, etc., etc. 107. But Christian piety was not satisfied with uniting the faithful in unions and societies for the purpose of attaining more speedily the various pious objects aimed at. The devout members of the Church felt themselves moved to organize such unions or societies also for the purpose of combating some prevalent heathen custom, or as a means of impugning more effectually some particular sin or vice. For instance, there were confraternities against unchaste jests and conversations, against forbidden marriages, against intemperance in eating and drinking, etc. The faith and charity with which the Church was animated in the past, are still living and operating within the Church of to-day. One of the most laudable Christian enterprises of the present age—a work highly beneficial to the deceased as well as the living—is the Society against Extravagance at Christian Funerals. This Society, founded in England, has been spread to some extent in our own country, the United States of America. God grant that this Society, productive of so much good, may grow more and more in strength and influence for the spiritual benefit of the living and the dead! 108. To surround death with excessive indications of sorrow and mourning shows a deplorable degeneracy.of the Christian spirit. The Divine Founder of our religion, who sent His own Paraclete to be our Consoler, has robbed death of its sting. "Death is swallowed up in victory." (I. Cor. xv. 54.) It is the object of the Christian religion to bring consolation to mankind on this very point. The natural feeling of a Christian at the burial of one of his brethren ought to be joyous, buoyed up by the hope of a blessed immortality, by trustful confidence and resignation to the will of God. O religion, truly divine, how consoling thou art to the just! What a wellspring of joy dost thou open to him by the promise of a blissful eternity ! What could give us greater consolation than the hope of another, better life, where sin, sorrow add death shall no longer reign ? And this is the goal to which we are led by complete and perfect abandonment to the will of God. Whosoever truly desires to possess God, resigns himself fully to the dispositions of His Providence; he is discouraged at no trial, however severe ; patiently he undergoes every probation. This resignation is the foundation of every virtue, it is a cause of true happiness; it is the virtue by which we attain to bliss here and hereafter. 109. The principal concern of a Christian in the hour of death should be the welfare of his soul and not the care of his body. His burial therefore ought to correspond with all these sentiments. But, alas! in our age the love of display at funerals has taken so deep roots that societies are founded for the purpose of providing the poor with the necessary means of gratifying at funerals this perverse sentiment of show and extravagance, thereby withdrawing the attention of the faithful from the soul of the deceased and directing it to the body. This is a perversion of the respect due to the dead, of which all those are guilty who ignorantly regard such extravagant demonstrations of mourning as tokens of honor and love. Real sorrow at the death of a member of one's family does not seek expression in a pompous funeral; therefore Christian burials ought to be models of simplicity. Such a society for the benefit of the poor ought to take for its aim to oppose all worldly display at funerals of this kind and to do away with costly monuments and unchristian symbols. At burials the thoughts of a Christian should be directed to his last end; hence he should be more concerned about the soul of his deceased friend or relative than about his body. At the moment of its departure from the body the soul appears before God's judgment seat. Those who have departed in the state of grace, but whose works, though good, are yet found wanting in perfection, are sentenced to make atonement in Purgatory. However great our sorrow at parting from our loved ones naturally is, the thought that we can mitigate their sufferings is a truly consoling one, and calls our attention to the means by which this is to be done. Our very nature prompts us to pray for the deceased in general, and much more so for those who were dear to us in life. This sentiment, instilled into our souls by God, cannot be a false one; therefore alms and other works of suffrage for the Suffering Souls must be pleasing to God. But the most efficient means of relieving, consoling and releasing the Souls in Purgatory is the Holy Sacrifice of the Mass. The Society against Extravagance at Funerals directs its principal efforts to procure for the Suffering Souls a truly Christian demonstration of love and respect. The personal expressions of sorrow in which the relatives indulge are rendered sacred in a special manner by the renunciation of a pompous funeral. This renunciation is an alms much more acceptable to God than any charitable gift to the poor; for by it many are dissuaded from lavish extravagance, whereas the gift of charity lends temporary assistance only to a few persons. 110. Moreover, the members of the Society endeavor to make extraordinary sacrifices for the benefit of the Suffering Souls. What others spend in the service of the world, they devote to the assistance of the poor, to the conversion of infidels and heretics, to the relief of poor convents and religious Orders, and to Holy Masses for the dead. They carefully avoid sin and lead a godly life; above all, they do not indulge in impurity, regarding their bodies as temples of the Holy Ghost. They patiently bear the trials and ills of life. All this they do for the special intention of bringing consolation and aid to the Suffering Souls in Purgatory. Is it not most honorable to belong to such a confraternity or society and to be able to think: "I do my part and have my share in all the' good achieved by it, in all the blessings dispensed through its agency?" Is it not a most noble charity to pray daily for our brethren? Is it not consoling to think: "Thousands pray for me every day ?" Can we thereby not hope to receive many more graces ? And are the numerous indulgences so easily gained by the members of a confraternity not of immense value? By them we shall be relieved of a lengthy punishment in the next world, and at the same time we can relieve souls now undergoing it. What should we desire others to do for us after our death? We should ask, not that they make an extravagant display at our funeral, but that they obtain for us the suffrages of our brethren and the services of the Church.—May God in His mercy imbue the hearts of the faithful more and more with such sentiments, and unite them in such confraternities for the welfare of the living and the relief of the Suffering Souls! 111. William V., Duke of Bavaria, ordered in his last will that at his funeral every kind of extravagant display shall be omitted. In particular he directed that no eulogy should be delivered, but in its place there should be a sermon on the art of dying well. He also ordered, that before his interment in the church of St. Michael the funeral cortege should be preceded by the cross and a banner emblematic of death; that the bier should be attended by seventy old men and seventy old women in mourning, whom he had assisted in their poverty during life. He moreover forbade the erection of a monument, ordering in its place a plain cross with the inscription to be seen to-day : "Awed at Thy majesty I tremble for my sins; when Thou comest to judge me, O Lord, do not condemn me,"
An example worthy of imitation was given also by the late Mr. Cooper, a lawyer in New York. In his last will he specified a small amount of money which must suffice to cover his funeral expenses, permitting no more carriages than were necessary for the members of his family. The sum thus saved was bequeathed to St. Francis hospital and other charitable institutions.